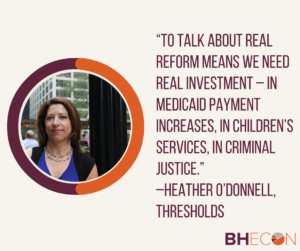 On October 6, the Community Behavioral Healthcare Association of Illinois, the Illinois Association for Behavioral Health, and the Illinois Association of Rehabilitation Facilities, in partnership with the Behavioral Health + Economics Network (BHECON) hosted a discussion on Integrated Health Homes. Participants heard from experienced clinic executives, state agency representatives, and national experts on mental health financing, who will shared how have other states succeeding in implementing this care model and the challenges they encountered during the transformation phase. Click here for the forum’s agenda. Illinois’ ongoing budget impasse has pushed the need for more advocacy and innovation from the behavioral health sector in the state. Attendees noted that behavioral health care providers in Illinois have suffered from inadequate Medicaid rates and state budget cuts. This has resulted in the closure of many providers, particularly in underserved areas. In order to turn the tide, a bipartisan panel of five state legislators offered advice on how behavioral health providers can engage legislators to build support for the field’s priorities. The panel highlighted cost-effectiveness data on treatment services and Illinois’ health home project as vital steps towards creating a more stable behavioral health system. Illinois state lawmakers emphasized that concrete data in cost savings and outcomes is essential for moving mental health legislation in a budget shortfall environment. Data in combination with personal stories from consumers and families is an effective advocacy tool to persuade legislators to invest state dollars in community behavioral health. When it comes to data collection, some providers urged agency leaders to communicate with their staff about why they’re collecting specific data and take steps to minimize overall collection. Discussion also centered on making sure that providers are collecting the right data. For instance, health care outcomes should not be measured solely by whether or not a particular condition was cured or alleviated, but by improvements seen in that health condition. Moving into the afternoon, Kim Yeagle, a leader in Missouri’s health home program, shared strong data on the value of health homes in cutting health care costs. In 2012, Missouri established the Community Mental Health Center Healthcare Homes program serving individuals with serious mental illness. Missouri’s mental health care homes have shown great cost savings by reducing hospital and emergency room utilization by 14%. Health Homes integrate and coordinate all primary, acute, behavioral health, and long-term services to treat a patient holistically. Yeagle explained that this model is particularly effective in helping individuals with complex and co-morbid conditions. In Missouri, individuals with serious mental illness who were not engaged in treatment for their mental illness were targeted as participants for health homes. The transformation in service delivery in Missouri did not come without its challenges. Yeagle pointed out the difficulty in training behavioral health staff to monitor and participate in physical health care monitoring for their patients and teaching primary care physicians to partner with behavioral health providers in treating their patients. Most Illinois providers in attendance explained that they not yet in a position to capture sophisticated data, lacking the capacity or infrastructure to collect, report on, or analyze data. Yeagle urged Illinois providers wanting to participate in the health home project to start the process of collecting data and begin thinking about who their community partners would be. Claire Bohmann gave an overview of a local example of an integrated care model operated by Centerstone, a national non-profit organization that specializes in behavioral health. Centerstone’s Health Integration Program in Alton, Illinois serves over 400 adults with serious mental illness. Their model has demonstrated reductions in psychiatric hospitalization, justice system involvement, homelessness, and emergency room use, for a total savings of $10.6 million in just 2 years. Missouri health homes saved $36.3 million, with community mental health clinics responsible for $31 million of the total savings.